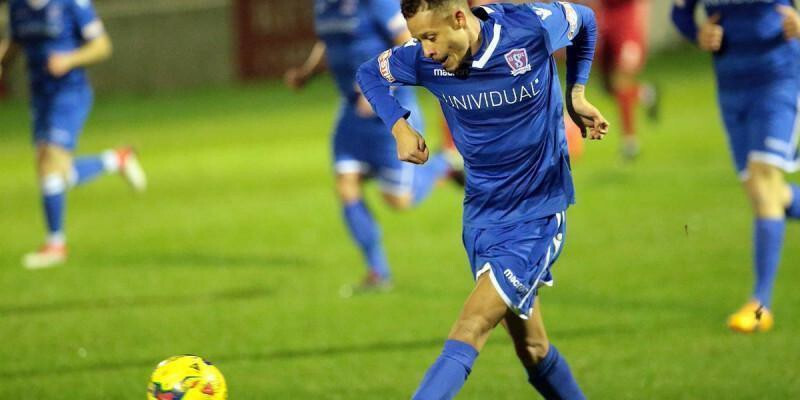 Swindon Supermarine secured a crucial three points on a cold Tuesday night in Somerset as goals from Ryan Campbell and Conor McDonagh saw them come from behind and jump above their opponents in the table. Manager Lee Spalding changed things up a bit as Matt Coupe came back into the side in place of Zak Westlake, Connor Thompson played at right back ahead of Jon Else, Dave Bampton returned to the side in midfield instead of Joe Shepherd, Campbell also returned whilst McDonagh had to make do with a place on the bench. The Frome pitch looked in fantastic condition and Spalding’s men started well. With a quarter of an hour on the clock, Brad Gray saw an effort from distance deflected wide for a corner, which Gray took himself. Centre half Matt Williams, fresh from scoring last Saturday against Harrow found some space in the box, but his glancing header fell wide of the far post. Another new signing Jamie Edge then went close, but his volley from 18-yards went wide of the target. The against the run of play, the home side then took the lead after 20 minutes. Kriss Miller managed to work some space down the right hand side and after firing a low shot, Will Henry managed to parry out at his near post, the back four couldn’t get it clear and Kriss Miller picked up the rebound himself to curl back past Henry with his left foot. It was a blow for the manager who prior to the game had mentioned the importance of keeping a clean sheet. “It’s important that, if we get opportunities, we score, and we make sure we defend properly to get a clean sheet. We’ve only had one clean sheet all season in the league, which isn’t good enough,” said Spalding.“First and foremost, we’ve got to make sure we keep clean sheets. That will be our goal – to make sure we come away with a clean sheet. His side almost hit back immediately, when Michael Hopkins got forward, but his effort from distance curled over the bar. It wouldn’t be long before the away side did draw level though when an excellent flowing move from back to front, side-to-side including some fine interlinking between Stuart Fleetwood and Brad Hooper resulted with Ryan Campbell picking up the ball from Edge’s pass. He sidestepped a defender and arrowed a low, left footed curling effort with the outside of his boot into the far corner, it was an absolutely fantastic finish from the winger seven minutes before half-time which will surely be a contender in the goal of the season stakes. Both teams picked up bookings shorty before half-time and from Gray’s free kick, Bampton found himself unmarked at the far post, but couldn’t direct his volley goalward. The Robins had the first effort of the second half, but Kane Simpson hit his shot just wide of the post. Shortly before the hour mark Gray and Bampton were replaced by Selman and McDonagh which would be a key point in the final result of the game. Hopkins then did well to deny Alex Monks heading the midfielders rising from 18-yards shot off the line following a corner. Frome were starting to apply more pressure and forced a couple of corners and when the ball bounced up and hit Selman’s hand, the referee awarded the home side a free-kick on the edge of the penalty box. Ollie Knowles’ free kick though was a poor one, hitting the middle of the wall. With just under a quarter of an hour to play, the game swung massively to the away side, from a shot towards goal, it could have been adjudged that Jamie Edge had handled the ball in the box, however, the referee turned away the vociferous appeals and Marine scored a classic counter attacking sucker punch goal. They quickly moved the ball forward as Campbell poked it through to Conor McDonagh and he brilliantly cut inside and outside his marker and steered his low effort across James Carey and into the far corner of the net. It was a contentious moment and some of that old rub of the green Marine have been without so far this season. In the aftermath of the goal, Sam Teale was sent off for the home side, presumably for words said directly to the referee. The remainder of the game was superbly managed by Supermarine. They held the ball up well, passed and moved, kept possession and worked it into areas where Frome wouldn’t hurt them. Everybody played their part in the game management in that final 15 minutes which will undoubtedly be very pleasing for Spalding. Frome did force a corner in the 5th minute of injury time, but Henry did excellently to punch clear before the referee blew for full-time. Marine pressed high all game and didn’t let their opponents have any time on the ball. It was an excellent all round performance that the manager can be very proud of. These are the type of results that can turn a season and provide a foundation for building on.